The 2018 database of Enterprise IoT projects contains extensive information on 1,600 real IoT use cases, including details on project location, industry, end-user as well as key vendors involved in each project. IoT Analytics, a leading provider of market insights and strategic business intelligence for Industry 4.0 and the Internet of Things (IoT), today published a comprehensive IoT project database, focusing on non-consumer IoT use cases. The new project database itemizes 1,600 publicly announced IoT case studies in greater detail across 10 major segments covering applications in 70+ countries worldwide. More than 760 IoT vendors are identified as either hardware, software, or connectivity providers for these projects. 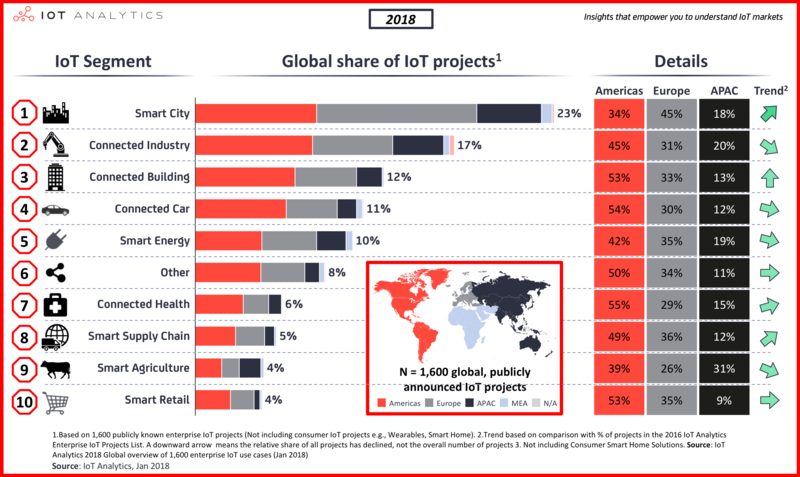 IoT case studies which are part of Smart City initiatives make up the largest part of identified projects (23%), followed by projects implemented in Industrial settings (17%) and projects evolving around Connected Buildings (12%). Most identified projects are set in North America (43%), however, Europe (35%) and Asia Pacific (16%) also play an important role. The database entails only Internet of Things use cases which have in fact been realized or are currently being completed. In the majority of projects, the end-user can be identified by name and a link to an online project description is available. All information is presented in a structured form, allowing for a wide range of further analyses and deep-dives. In conjunction with the list, IoT Analytics also published a 32-page research summary document, detailing the most important findings of the IoT project research and contrasting the numbers to a similar study performed in 2016. The List of 1,600 Enterprise IoT Projects is available to purchase HERE. IoT Analytics is a leading provider of market insights & competitive intelligence for the Internet of Things (IoT), M2M, and Industry 4.0. Headquartered in Hamburg, Germany, IoT Analytics provides industry market research in the form of analyst reports and bespoke research projects. Research publications such as this one can be purchased in the online store. Companies subscribed to the IoT Analytics Membership program get unlimited access to all published reports. IoT Use Case Detail – General information about the IoT use case (description, industry, location and link to more information). End user /company IoT solution – Information about the company employing IoT (description, industry, homepage and location) and type (end user or IoT solution vendor). Value proposition of IoT deployment for the company (e.g., classified as revenue, cost, safety, other and description of results, if available). IoT infrastructure – name of vendor(s) involved in the project (e.g., companies providing hardware, software, connectivity and other for respective project) and type of connectivity. IoT use case classification – differentiating between 10 distinct IoT types (e.g. Smart City or Connected Industry) and a set of 56 subtypes. Additional info – Basic project info including start date (year) of the project, the project phase (e.g., pilot or full deployment), the project size and generic contact details (e.g., email, telephone, name). ABB, Accenture, Advantech, Aeris, Amazon, Arrayent, AT&T, Ayla Networks, Autodesk, Blip Systems, Bosch, Carriots, C3 IoT, Cisco Jasper, Dell, Digi International, Deutsche Telekom, Echelon, Ericsson, Eurotech, Evrythng, eWON, GE, Geotab, Gemalto, Google, HMS Industrial Networks, Huawei, IBM, Impinj, Intel, Kore Telematics, Libelium, LoRA, Microsoft, Numerex, Oracle, Qualcomm, PTC, Relayr, Rockwell Automation, Samsung, SAP, Schneider Electric, Semtech, Siemens, Sierra Wireless, SIGFOX, Silver Spring Networks, Software AG, Telefonica, Telit Communications, Verizon, Vodafone.